In Part 6 of Wilfrid Webster's checklist, published in the January 1956 issue of The Carto-Philatelist (Vol. 2, No. 1, p. 4) this stamp is described as follows: "Map of Shanghai and the estuary. $3 yellow and $6 blue. There are three distinct 'map' errors on the $3 value." The stamp was printed in Japan and issued August 1, 1944 to mark the first anniversary of the surrender of the European areas of the city. 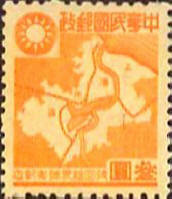 According to William R. Horney in Weekly Philatelic Gossip, June 3, 1950, p. 401, "There are at least three map stamp varieties of the $3 yellow.... (a) The municipal district is shown with 'additional territory northwest of Shanghai' on one of the stamps in the bottom horizontal row of the sheet. (b) The municipal district is also shown with 'additional territory southeast of Shangai' on one of the stamps in the second horizontal row from the top. (c) There is an 'extra island' in the Yangtze River on one of the stamp in the second vertical row from the right." "Varieties," production varieties, are not "design errors."